Enduro 50 Grout is specially designed for damp pack to fluid applications. It is a blend of Portland Cement and natural aggregates with cementitious expansive agents. Recommended applications include grouting of equipment bases, column bases, precast walls, tiltup panels, tie holes, etc. Flowable and self-leveling, non-staining; will not rust. Non-shrink for maximum bearing. Does not contain any corrosive chemicals such as chlorids and is high strength. CRD C-621, ASTM C-1107, ASTM C-827, ASTM C-1090. Illinois Dot Approved. A high performance, non-shrink, precision grout designed for a wide range of consistencies from damp pack to high fluidity. Meets the most demanding job conditions. Designed for maximum flowability and strength. 100 Non-Shrink, Non-Metallic Grout is blend of Portland Cement and specially blended aggregates and cementitious agents. Recommended for grouting of machinery bases, structural grouting of steel and precast columns, anchor bolts, dowels, crane rails, and handrails which require non-shrink, high tolerance, high strength performance. Holds up to industrial machinery vibration and impact. Flowable and self-leveling for easy placement. High strength for heavy equipment and non-staining. Positive expansion for maximum bearing. Excellent adhesion to concrete and steel. Corps of Engineers CRD C-621, ASTM C-1107, ASTM C-827, ASTM C-1090. Illinois Dot Approved. A high performance, non shrink, precision grout designed for a wide range of consistencies from damp pack to high fluidity. Meets the most demanding job conditions. Designed with maximum flowability and strength in mind. 100 Non-Shrink, Metallic Grout is a blend of Portland Cement and specially blended steel, aggregates and cementitious agents. Conspec All-Patch is a single component, cement based, polymer modified, patching and repair product for any maintenance and new construction projects. All-Patch can be applied from featheredge to 1 inch per lift. All-Patch can be used for horizontal, vertical, and overhead surfaces. All-Patch is specially formulated for vertical and overhead patching and concrete repairs of holes, cavities and cracks. Use All-Patch for special shaping after material is set. LPL Patch is a specially designed, single component patching and structural repair product for any maintenance and new construction projects where prolonged working time up to 40 minutes and fast strength in two to three hours is required. LPL Patch may also be used as an underlayment or for overlay applications. For all structural and general horizontal concrete repairs (interior, exterior, above grade) where sufficient working time during placement and high early strength is required. LPL Patch may be used on vertical surfaces when mixed with Strong Bond. Rub Crete is a one-part, polymer modified material specially formulated for rubbing, smoothing, resurfacing, repairing andrestoring concrete surfaces. Rube Crete is designed with a chemical additive to ensure superior bonding characteristics. Rub Crete can be used to repair new and old concrete surfaces. Repairs damaged or rough concrete and precast panels. Resurfaces concrete floors. A two component polymer modified cement-based patching and leveling material. Special Patch can be featheredged at any thickness. Wear resistant. Special Patch is for interior or exterior applications. For all concrete structural and general repairs (inside, outside, above and below grade). Use where added durablility adhesion and abrasion resistance are required. Resurface sanitary and industrial floors. Use for a load bearing semi-self-leveling topping. Can be featheredged to any thickness; no need to cut edges. Wear resistant to heavy forklift traffic. Hardens for foot traffic in one to three hours. Excellent bonding characteristics. Impact resistant, high strength and high abrasion resistance. Conspec Conpatch V/O is a single component, cement based, polymer modified patching and repair mortar for vertical and overhead applications. However, due to excellent durability and ease of application without the use of forms. 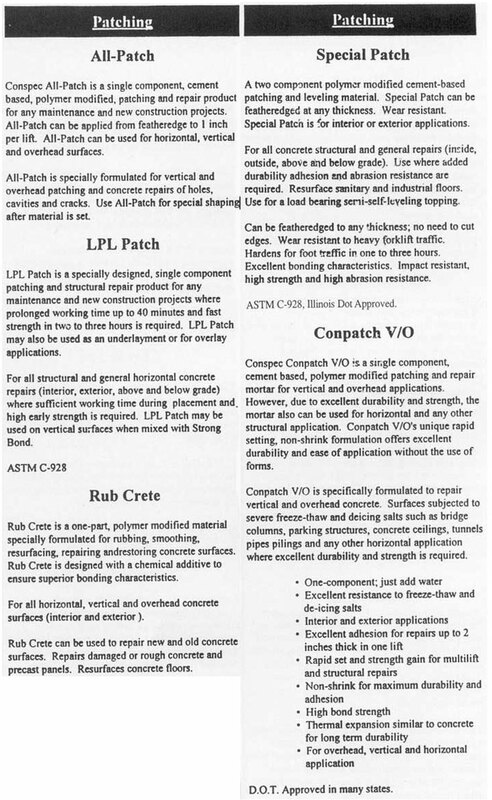 Conpatch V/O is specifically formulated to repair vertical and overhead concrete. Surfaces subjected to severe freeze-thaw and deicing salts such as bridge columns, parking structures, concrete ceilings, tunnels pipes pilings and any other horizontal application where excellent durability and strength is required. D.O.T. Approved in many states.